Stay on top of hospital safety requirements and best practices with our free, fast-paced weekly update. Register now for your free e-newsletter! Hospital Safety Insider is a free weekly e-mail resource for hospital safety officers and others interested in environmental of care issues, including Joint Commission compliance, fire safety, and OSHA, CDC, and EPA compliance. This weekly e-newsletter is now archived and fully searchable at www.hospitalsafetycenter.com! 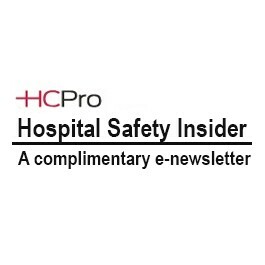 Each week Hospital Safety Insider offers hospital safety news from around the country, as well as analytical pieces, the latest blogs from our experts, and great deals on the latest HCPro webinars and resources that can help you do your job better!